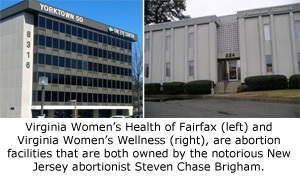 Due to his deceptive and dangerous practices, Brigham was ordered to have no part in abortions businesses in Pennsylvania. In Maryland, all four of his licensed abortion facilities were ordered to close last year after authorities discovered that a patient had died and that drugs were administered incorrectly, creating a danger to the public. Brigham also served time in prison in 1998 for billing fraud and has been in and out of court with suits filed by creditors for unpaid bills. Records indicate he was involved in bankruptcy proceedings in Connecticut in 2000. Both of Brigham’s Virginia facilities have been cited for multiple safety violations that reflect a gross disregard for their patients. • Failure to disclose facility ownership. • Failure to conduct criminal background checks on employees. • Failure to provide patients with contact information where complaints may be filed. • Improper handling and cleaning/sterilizing of dirty surgical equipment. • Failure to change gloves between handling a “dirty” suction machine jar containing bloody aborted baby remains and handling a clean one. • Four out of five recovery room recliners were noticeably dirty and broken. • Tears were found in patient examination tables. • Failure to properly maintain patient monitoring equipment. • Failure to follow manufacturer’s instructions for administration of controlled substances. • Failure to ensure that injectable drugs were mixed and labeled in accordance with regulations. • Failure to develop a required quality assurance program. • In 13 of 13 abortion records inspected, all patient records failed to note specific drugs administered in the local anesthetic. • Facility failed to meet building standards. • Failure to verify licensing or certification of health care professionals. • Failure to clean reusable medical equipment between patients. • Failure to maintain other infection control protocols. • Mishandled and improperly stored medications. • Failure to note patient’s condition upon discharge in patient record. • Failure to maintain adequate medical records with additional omissions of information.